I sure had preferences for the man I was hoping to one day marry. I wanted him to be a godly man, a virgin, hard-working, athletic, and taller than me! Was I wrong to have these standards? No! And neither are any of you but you must expect high standards for yourself, too; for we are promised that we will reap what we sow. I asked my husband if he would have wanted to marry me if I had slept around, had high amounts of debt, and tattoos and he said, “Absolutely not!” No, none of us will ever be perfect but some sins are much more destructive to the happiness of a future marriage than others. Mychael Klajic wrote a well-thought out response to my article. She wasn’t a virgin, had debt, and a tattoo when she married. She clearly understands the consequences of her sin and doesn’t try to hide this fact. We all live with regrets of past actions because sin is destructive. We should never try to minimize sin and say that it is not harmful. It is! We must repent from our wicked ways and seek to live holy lives as His Spirit works mightily within us. For me to teach young women to be virtuous seems to be forbidden in many churches today apparently, as is teaching women to be submissive towards their husbands, silent in the churches, and being keepers at home. Something is so wrong about this! I completely disagree with this sentiment and will continue to teach younger women the ways of godliness because they are good and for their good! First of all, what is sin? Here’s the biblical definition, not the philosophical one. Secondly, does have have a caveat? Can we be exceptions to God’s rules? Thanks for the post, Lori! I have a cousin who is a virgin and has no debts and no tattoos. While men may say that they prefer women like her, no one pursues her. But that is all right with her because she prefers not to marry if no one will have her. She follows Jesus who said “there are eunuchs, who have made themselves eunuchs for the kingdom of heaven’s sake. He that is able to receive it, let him receive it” in Matthew 19:12. Saint Paul also wrote, “I say to the unmarried and to the widows: It is good for them if they remain even as I am” in 1 Corinthians 7:8. You’re right, Mary. She is living in obedience to the Lord regardless of the outcome! “Not my will but Thine be done” and she can still be used mightily by the Lord in her singleness. The Lord has this to say to the unmarried: “The unmarried woman careth for the things of the Lord, that she may be holy both in body and in spirit” (1 Cor. 7:34) and she is living this out. She is storing treasures in heaven! Hey Mary, as a guy who is waiting until marriage I can assure you that I prefer a girl who shares my values and I would rather be single than settle for one who doesn’t. In fact, I’m in my early 30s and have never been in a relationship over this matter. I dont know why your cousin hasnt been pursued but from a guy’s perspective it can be very difficult to sort out the girls you want to pursue from the girls you don’t. “Are you a virgin that’s waiting until marriage?” Isnt something you can drop in casual conversation. Moreover, the biblical ways have been so stigmatized over the years that if people found out I’m looking for a virgin I’d be labeled a creep or they’d call me insecure (despite the fact that I myself am a virgin by choice). So if 95% of women dont practice abstinence and I can’t ask which is which, you can imagine how difficult it can be to know who to pursue. I tried pursuing one girl and after a year I found out she had multile previous partners. Although I immediately stopped pursuing, I still lost a year. I don’t have the time to sort through 100 women to find 5 potential partners so what is a guy to do? I like to observe people from a distance, and gravitate towards those who exhibit christian like behaviour. But its not easy to witness these tells outside the church. You have to pray and hope you run into the right one 🙂 or find a better way to signal what kind of girl/guy you are so we can find eachother in this cultural hodge podge! This is one of your best, Lori! And the concept is so sinful. Christ’s work accomplishes forgiveness, but it does not negate God’s principles for living, or the consequences for disobeying those principles. So simple, and yet people fight so incredibly hard against that basic truth. I’ve followed this from a distance over the past week, and you’ve conducted yourself with amazing dignity and honor, Lori – good for you. Blog on, there are those who do hear! My only argument would be that the church started it and sold it to the world. 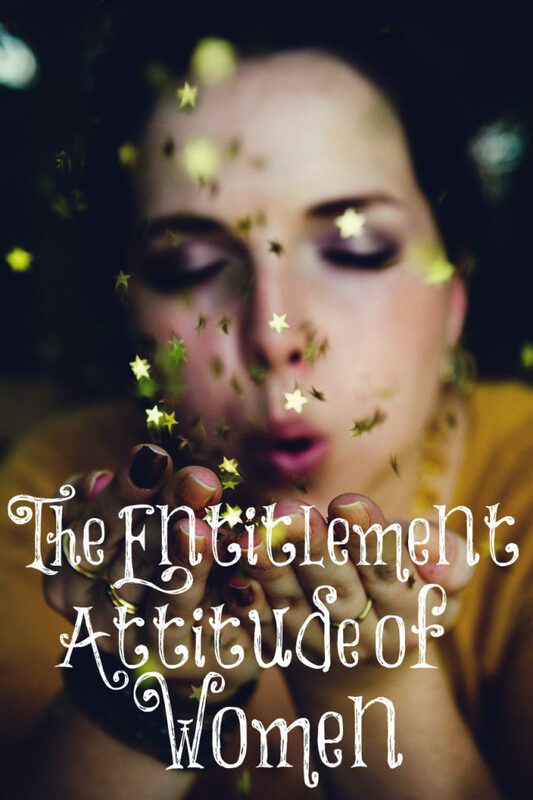 This entitlement is very deep and may be deeper than you care to go. It is very briefly summarized in Genesis 3:16: her desire is to rule him, and his charge is to rule her. Interpreted: he has the charge, the authority of good, of order, of God; she has the charge, the (illicit) authority of rebellion, of disorder, of Satan. He is the agent of God. She is the agent of Satan. This is in the male all his life, in the female all her live. This is how Satan attacks God, by using women to attack men, who hold the authority of God. “Hath God said?” Eve bought the lifetime subscription. “Thy desire shall be to thy husband…” is a lifetime fight for the woman that will surrender to the Word of God. Hence, why the “in everything” in Ephesians 5:24, among many other verses. Your articles are ones I enjoy reading with the truth plainly and unapologetically presented. Well done. D them his wife was a virgin when he married her. Then he asked, “Are You a virgin?” Good question to ask the men. Genuine Repentance means leaving sinful pasts behind and learning to live in purity, Holiness and ongoing sanctification for life. Huge changes in thinking, behavior and attitudes must bear fruit for God. Out teenagers both female and male need to be taught godly lifestyles, modesty, purity and how to become secure in their new identity in Christ. Healing for hurts and damage done by others must be part of their holistically care. Girls especially need to be encouraged and learn how to value and respect themselves, without dependency on male approval. No more double standards in society and the church. May God help us. Helen, you want to talk about double standards? When a man fathers a child out of wedlock, he is shamed, pursued by the law, and derided as a “dead-beat Dad”..and rightfully so. When was the last time you heard the term “dead-beat Mom?” to describe women who procreate out of wedlock, party, squander their welfare checks, sleep around, etc? Probably never, because we are told we cannot judge the choices a woman makes. Actually, deadbeat dads are called as such because they do not provide or raise their children. They are simply not present! I know plenty of deadbeat dads who produced their children in wedlock but they still do not act as a proper father should. I also know fathers who were not married when their children were born but they are good providers and they raise their children well. And deadbeat moms do exist!